The 4.5-kilometer (2.8-mile) park along Donghao Chung, runs for a time beneath an elevated freeway. At other moments it pools in a plaza open to the light and the sound of fountains. Click image to enlarge. There is always risk in heaping such rhapsody on a single example. Still, in its characteristically handsome Chinese design, and in the cooling embrace of its flowing water, the Donghao Chung greenway defines something very new about this city and this nation: ecological principles are steadily rising nearer to the top of China’s economic priorities. Six years ago I made my first visit to China, which was still caught up in the storm of infrastructure construction, energy production, and urban development that made it the world’s second largest economy and among the most polluted places on Earth. Though China was simultaneously building dozens of energy-efficient underground metro systems, a 10,000-kilometer (6,200-mile) high-speed rail network, and the globe’s largest wind, solar, and hydropower production sectors, top government officials did not express genuine interest in the ecological condition of their country. Guangzhou, the capital of Guandong Province, calls itself the “City of Water.” The Pearl River is the city center, spiritually and economically. Click image to enlarge. Perhaps in a triumph of rational recognition over economic ideology, or maybe economic rationale recognizing the painful consequences of rampant pollution, China is a changed nation in 2015. A year ago China reached a pact with the United States to reduce its climate changing emissions. A month ago, China announced it would establish a national carbon emissions trading market by 2017, a move to achieve the emissions reductions. Beijing, Shanghai, Chengdu, Harbin, and other big cities regularly announce new policies and practices to clear the air of dreadfully high levels of particulates and build new treatment plants to make the nation’s rivers and lakes safe. A good deal of the justification for taking these actions, and for spending the billions of dollars that it costs every year, resides in this provincial capital of 16 million to 18 million residents (nobody is quite sure), China’s third largest city. 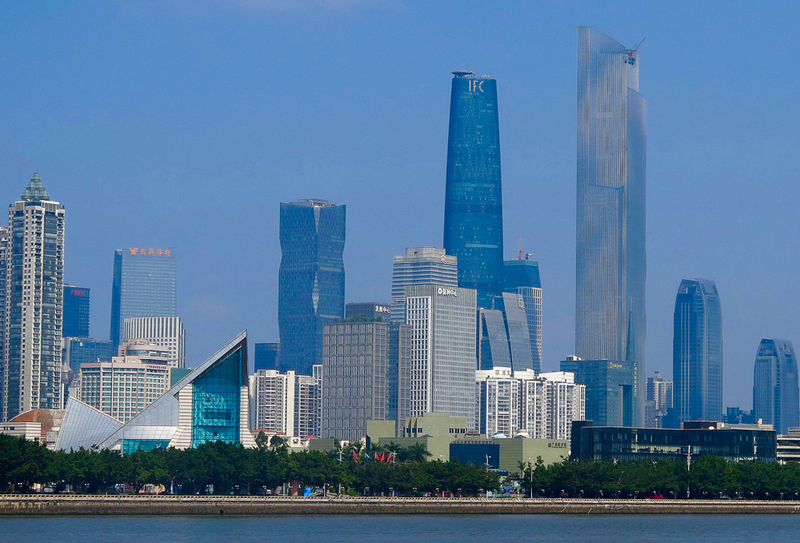 For several years, as the rest of the world now knows, Guangzhou’s economy has been slowing and shifting, from heavy reliance on manufacturing to new layers of professional, finance, travel, real estate, banking, and service enterprises. City business and government leaders anticipated the transition and, embracing new urban design practices from the United States and Europe, set out to remake the city to encourage young and educated adults to settle here. The Pearl River, which flows through the city center, became cleaner. The air, still smoggy, is clearer than in China’s other major cities. 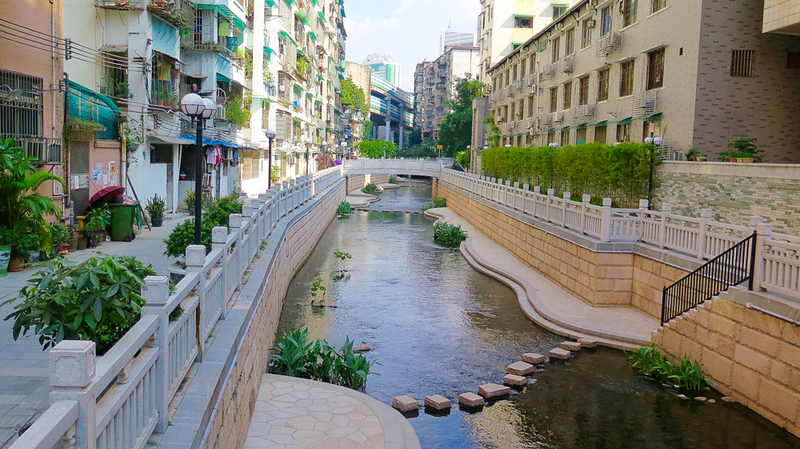 China’s mastery of public space design and water architecture is evident in Donghao Chung, once an ancient moat, then a sewer, and now an urban oasis. Click image to enlarge. The world’s second largest bus rapid transit system was constructed along a major boulevard and serves 850,000 riders a day. Requirements for new high-rise apartment and office buildings include measures to improve energy efficiency. And showcase water infrastructure was included — new urban lakes, riverside parks, and the 4.5-kilometer (2.8-mile) Donghao Chung greenway. 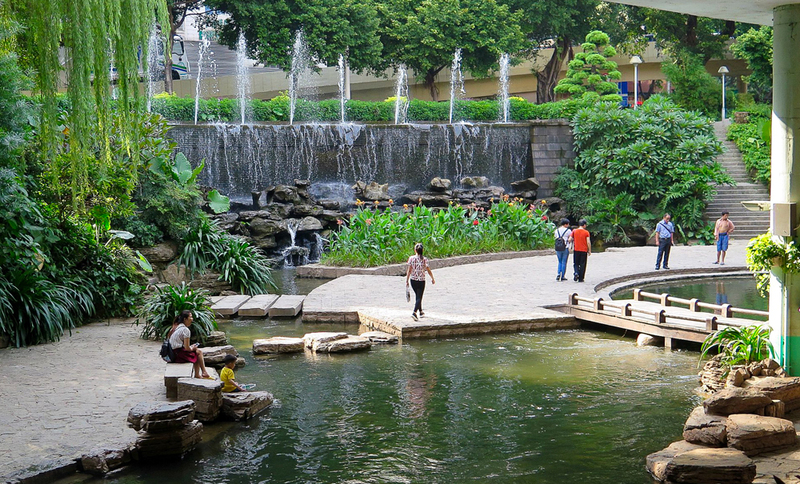 From where the greenway starts as a magnificent esplanade coursing through tightly packed neighborhoods to where it ends in a cascade of fishing ponds, fountains, and pools, Donghao Chung displays design artistry matched in few other places. In summer, throngs are drawn to the waterway to soak in its cool and clean water. During fall afternoons, mothers stroll with their children and rest on carefully placed shoreline rocks. The various spaces incorporate the narrow, cozy, alley-like patterns that were the urban design standard of old China cities and now are experiencing a revival. The mega scale of cities like Guangzhou, built with 20th-century principles of size and efficiency, are being trimmed in the 21st. The ties between water, development, and Guangzhou’s long history of economic transition also are embodied in Donghao Chung. The waterway started its existence as a moat protecting the great stone walls of ancient Guangzhou, which dates to 200 B.C.E. When the city grew out of its walled enclosure, Donghao Chung became a drainage ditch, then an open sewer. In the early 1990s, as Guangzhou’s population blasted off, transportation engineers covered part of it with a big boulevard and built an elevated freeway above the rest. The channel’s sole purpose: transporting a noxious mix of runoff and sewage to the Pearl River. Business and government leaders in Guangzhou set out to remake the city to encourage young and educated adults to settle here. Click image to enlarge. Few here expected anything more from the old moat. 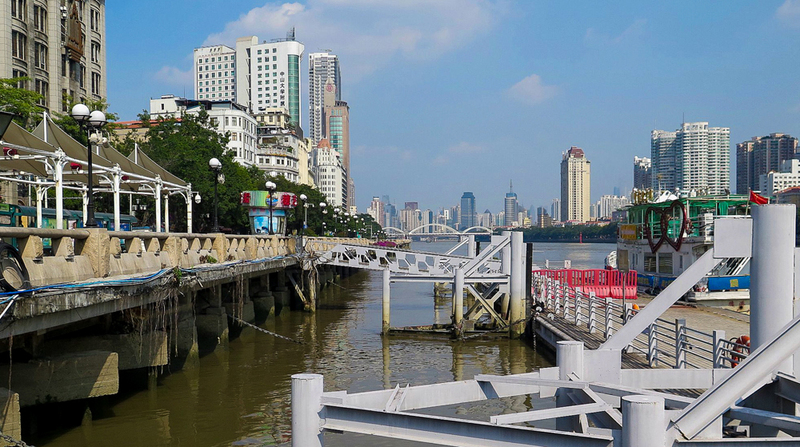 For almost 30 years Guangzhou sat at the pinnacle of an economic development pyramid that turned the communities along the lower Pearl River into the most heavily and densely populated metropolitan region on the planet. The 2010 China census put the Pearl River Delta’s population at 40 million people. The Shenzhen planning department reports there may be 60 million people now, a throng living and working in a water-rich region of 15,600 square kilometers (6,000 square miles), an area just a bit larger than Connecticut, the third smallest U.S. state. Suffocating air and dismal water pollution were viewed as the inevitable, even needed, consequence of development. Most of Guandong’s $US 1.1 trillion annual economy, exceeded in value in Asia only by Tokyo, is generated by the chemical, textile, paper, metals, computer, plastics, and other manufacturing and trade businesses in Guangzhou, neighboring Shenzhen, and the seven other major cities of the Pearl River Delta. The urban oasis of Donghao Chung that invites Guangzhou’s residents today displays different economic principles, especially the value of a cleaner urban setting. Getting there, though, requires new thinking and technology, both of which this ultra-contemporary city has in apparent abundance. The urban oasis of Donghao Chung that invites Guangzhou’s residents today displays different economic principles, especially the value of a cleaner urban setting. Click image to enlarge. 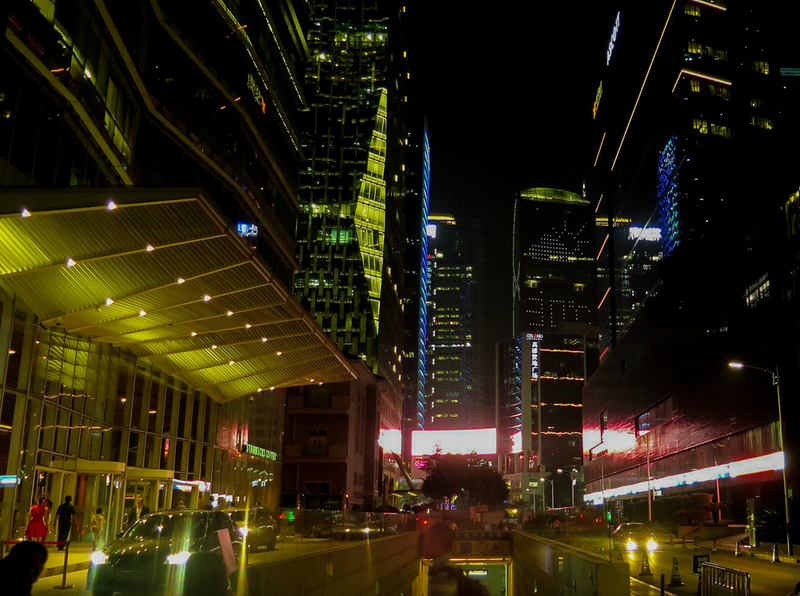 Building Donghao Chung required several engineering and design feats that have global significance. Arguably the most important is a water treatment plant constructed midway through the linear park, and a line of huge freshwater pipes installed underneath the channel. The installations supply clean water from the Pearl River and treat runoff and sewage that drains into the channel. Strolling by the gardens on the landscaped esplanade is a treat. Alongside is an odorless clean stream that looks as though it tumbled from nearby mountains. Can a polluted stormwater drain newly constructed as an urban park speak for a city? In the case of Donghao Chung, the answer is told in cool, running clean water.